Roman blinds can sit either inside or outside of the window recess. The same is true for Roller, London and Austrian Blinds. For measurements inside the recess, measure from top to bottom and from side to side of the recess. Take a series of measurements at different points in case the window edges are not straight. For measurements outside the recess, measure the width of the window adding about 5cm for each side, and measure the length from the required position above the window to the required drop below. If it is not possible to add 5cm, e.g. because of location of a cupboard in a kitchen, measure the width available. If in doubt, please do feel free to drop me an email or give me a call. 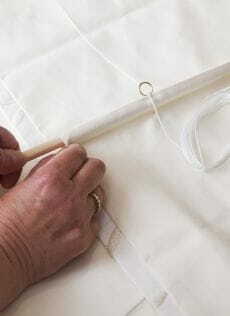 "I just wanted to say thank you for the excellent job you did on the Roman Blind you made for us. We were very pleased with the standard of the work and the speed in which you completed it. We will need some curtains making in the near future and will be in touch."